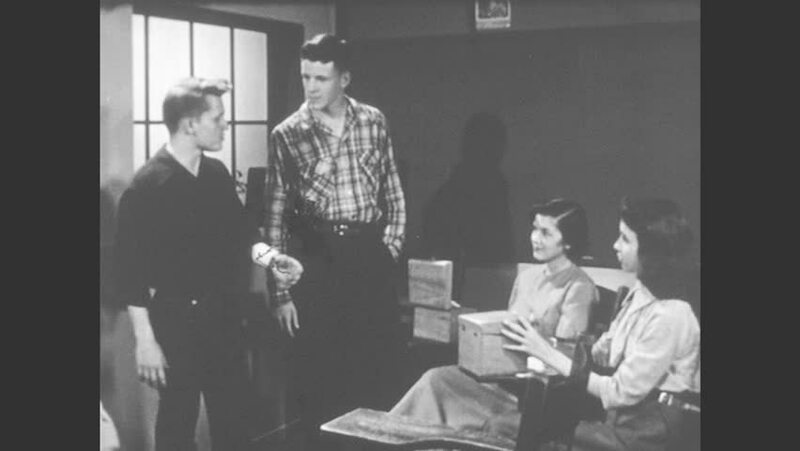 1950s: 1950s: teenage boy gestures with hands and talks to boy and girls in chairdesks with file boxes at school classroom. hd00:241950s: Man walks. Men speak. Men listen. Man smiles. hd00:311950s: teenage boys and girls sit in desk chairs and raise hands as woman reads from books and asks questions in classroom. hd00:221950s: People talk. Woman gestures. Group of people sit at table. 4k00:23Cuba 1940s: Boys marching. Girls marching. Boys march with flag. View of palm trees. View of coastline. hd00:52CIRCA 1940s - Adult advisors meet with teens at a club to discuss what time the club should close in 1949.
hd00:171960s: Woman in living room looks at shoebox with lid cut in half. Man gets out of chair and looks at shoebox with woman. hd00:301950s: Boys and girl sit at desks and talk. Boy in loose clothing speaks at head of class. Teacher stands in class and thinks to self. Question mark appears over classroom of students and teacher. hd01:28CIRCA 1940s - An animation shows fighters flying in a combat formation with bombers and a US Army Air Forces instructor teaches airmen in World War 2.